It’s that time of year when people look back at over the year that was 2014 (1-5). The place where I work, celebrated it’s 50th anniversary. Colleagues put together a little booklet of facts and figures with an some accompanying web pages to mark the occasion. My personal favourite factoid compares computing in 2014 with 1964. The Atlas Computer represented the state of the art in computing in 1964, and today that crown is held by SpiNNaker – a very different kind of computer. One way of looking at this data is to say, based on the the instructions per second, SpiNNaker is around ~5000 times faster than Atlas. But what is probably more interesting is that SpiNNaker (which is due for completion in 2015) is expected to be used by neuroscientists and psychologists, as a platform to study problems such as Alzheimer’s disease – something that would have been impossible (and unthinkable) only fifty years ago [6,7]. Wonder where the next 50 years will take us in 2064? In 2013, 44% of newly elected Fellows of the Royal Society had biography pages on wikipedia. A quick-and-dirty measure of the scientific coverage of wikipedia is the percentage of these fellows that have a profile on wikipedia at the time of their election to the prestigious Society. Let’s call it the Fellows of the Wiki Society index (FWSi), a good score of 100% indicates that wikipedia has excellent coverage of science while 0% indicates the opposite. Last year, that index was 40% because 21 out of 52 fellows were also Fellows of the Wiki Society. This year the index is slightly better at 44%, with 24 out of 54 fellows having a wiki-biography, see [1-54]. So as well as more women this year, there’s more wikipedia too, although the difference isn’t particularly big. If you’d like to improve the content of wikipedia because there’s plenty of good reasons for doing so, why not take a look at the guidelines for biographies of living persons and create or improve a page for one of the people below? 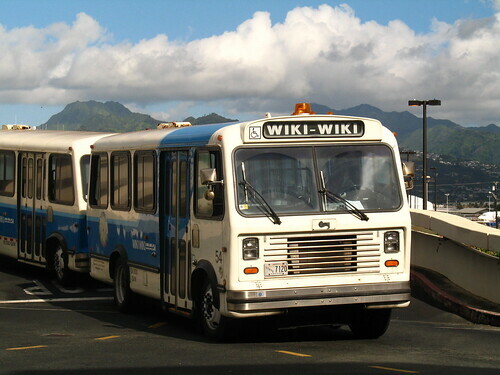 The wiki-wiki (quick) shuttle bus in Hawaii by xordroyd. Creative Commons licensed picture from Flickr. 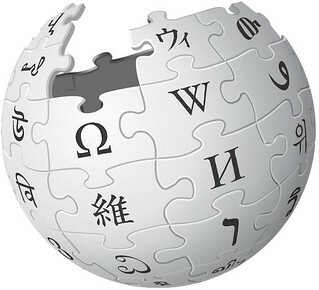 I floated your idea about Wikipedia in the Society and it is being looked at to see what might be possible. Thanks for your suggestion. Time passed and the English summer dripped by in it’s typically rainy fashion. Then, earlier this month, Francis Bacon (not that Francis Bacon, but this Francis Bacon) contacted me, to say the Society is organising an edit-a-thon. With help from Uta Frith, the society is going to investigate the possibilities of wikipedia using Women in Science workshop as a pilot project. See Women of Wikipedia edit planned on BBC News. This is great news and the event was fully booked in less than a day. It’s good to see a venerable society embracing new and disruptive technology in this way. Location Virtually the wiki-society is anywhere there is an internet connection. Physically, the head quarters are in San Francisco Based just off The Mall in London, many members cluster in the supposed Golden Triangle of London, Oxford and Cambridge. Other fellows are scattered around the provinces with expats and Foreign Members dispersed around the globe. Praised for Many things, see praise for the wikipedia and wikimedia projects. Funding excellent scientists and their Science. Engaging the public and young people in science through various events. Criticised for The worlds biggest database of half-truths and white lies, see criticism of Wikipedia. Patrolled by annoying or partial editors and administrators. It can be frustratingly difficult to verify sources and wikipedia often lacks scientific credibility . Being a nepotistic old boy network with an absence of women and very little in the way of youth. Ouch. Too many members have or currently work in, Oxbridge and London, possible geographic bias. Origin The name wikipedia comes from the Hawai’in word for quick Wiki, see picture top right. The Royal Society is named after the British Monarchy, set up with help from Charles I. The name is a bit of a misnomer as you don’t need to be a royalist to join – republicans are welcome. In Middle English, the word Royal means s-l-o-w, traditional and painfully conservative . So there you have it, the Wiki Society and the Royal Society are unlike each other in many ways but they share a common goal of spreading knowledge. Perhaps the scientific content of wikipedia will be greatly improved through edit-a-thons and other events like this. Hopefully, the days where wikipedia will tell you everything you ever wanted to know about David Beckham but (at the time of writing) has absolutely nothing to say about leading scientists like John Aggleton, Garret FitzGerald and Margaret Robinson are numbered. Thanks to Paul Nurse, Francis Bacon, Aosaf Afzal and Uta Frith for making it happen. If you can’t attend the edit-a-thon, watch this wiki-space via the twitter hashtag #WomenSciWP: interesting wiki-things might wiki-happen. 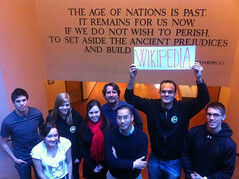 Fellows of the Wiki Society? Despite the elitist nature of many scientific societies, a significant part of what the Royal Society does is engage with members of the general public of all ages through a wide range of events. The annual Summer Science exhibition, Royal Society Blogs, Policy Centre and Royal Society television channel are just a few examples from amongst many more. However, many other scientists do not have pages about them on wikipedia. Unfortunately, alternative sources of information such as academic homepages are often out of date and not particularly engaging. Most scientists are too busy doing Science to spend time updating their home pages, as neatly illustrated by cartoonist Jorge Cham. At the time of writing, less than half of the notable and distinguished Fellows elected in 2012 have biographies on wikipedia, see below of details. Putting scientific information into wikipedia isn’t as crazy as it sounds. Alex Bateman at the Wellcome Trust Sanger Institute , PLoS Computational Biology  and many others  have already made considerable progress in improving the scientific content of wikipedia. This information is immediately accessible to a huge global audience. Wikipedia is arguably one of the greatest ever opportunities for public engagement in Science. By employing a wikipedian in residence, the Royal Society could improve and influence the scientific content of wikipedia, while engaging even more with the general public around the world, who are often just as interested in the scientists as the science itself. As the current president of the society I hope you will consider this proposal. Of course, 2012 is just the tip of the iceberg, there are also the Fellows elected in 2011, 2010 and so on back 350 years to 1660. 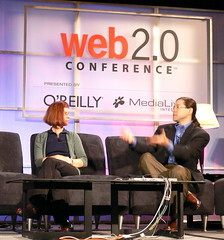 Need to re-invent the Web (badly)? There’s an App for that! I love the convenience of mobile applications but hate the way they re-invent the wheel and are killing the Web. What can be done about it? I’ve been smitten with the Web since first venturing out on the information superhighway back in the nineties. This love affair is taken to a new level with the advent of the mobile Web. As an incurable information junkie, having access to news is on the move is great. Using location based services like Google Maps is fantastic, on foot, bike or in the car. I love nerdily scanning barcodes to read Amazon book reviews while browsing the shelves in bookshops, much to Tim Waterstone’s annoyance. And it can be great to have wikipedia in your pocket to settle arguments down the pub. But there’s a big problem with all this appy clappy mobile fun, it’s killing the Web through fragmentation, both for producers and consumers of information. Let me explain. One of the great things about the Web is that you there is one app to rule them all; a “killer app” called a Web browser. There are several flavours, but they all basically do the same thing using similar technology: they let you surf the Web. One software application (a browser), gives you access to an almost infinite number of Web applications. Wonderfully simple, wonderfully powerful – we’ve got so used to it we sometimes take it for granted. Now compare this to the mobile Web where each page you visit on a mobile suggests that you download an app to read it. Where there used to be just one application, now there are thousands of glorified “me too” Web browsers apps many of which have re-invented the Web, badly. As you can see, users are encouraged to download, install, understand and maintain sixteen different apps to enjoy this small part of the mobile Web. 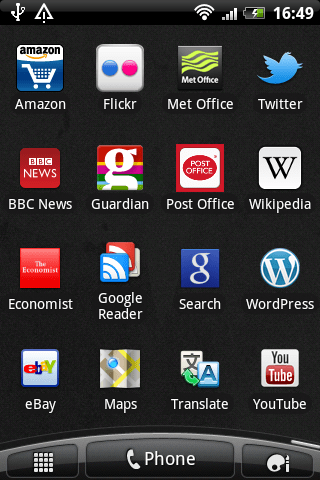 And this is just the tip of the iceberg, there’s bucket-loads more apps like this in Google Play and the App Store. As a user, you could just use a mobile Web browser on your phone, but you’ll be discouraged from doing so. We’ll return to this later. So a challenging task of delivering content onto a range of different devices has now been transformed into an almost impossible task of building and managing many different apps. It’s not just Twitter, Inc. that chooses to play this game. Potentially any company or organisation putting data on the mobile Web might consider doing this by employing an army of android, blackberry, iPhone and windows developers on top of the existing Web developers already on the payroll. That’s good news for software engineers, but bad news for the organisations that have to pay them. Managing all this complexity isn’t cheap. Not Appy: How do we get out of this mess? "Please develop HTML5 mobile web apps rater than native mobile apps!" urges @timberners_lee during his #keynote at #WWW2012 in #Lyon. There are lots of examples of this. Sites like trains.im provide train times via a simple Web-based interface, no app required. Many Web sites have two versions, a desktop one and a mobile one. Wikipedia has a mobile site at en.m.wikipedia.org/wiki, Flickr at m.flickr.com, The Economist at m.economist.com, BBC at m.bbc.co.uk/news and so on. But in many cases these sites are poor cousins of the native mobile apps that software developers have focused their efforts on, diluting their work across multiple apps and platforms. anything that gets invented after you’re thirty is against the natural order of things and the beginning of the end of civilisation as we know it until it’s been around for about ten years when it gradually turns out to be alright really. The mobile Web makes me suspicous because many apps re-invent the wheel. I’ve argued here that it is against the natural order of the Web, we’ve waved goodbye to the good old Web  and its the beginning of the end. I really hope not, it would be a tragedy to carry on killing the Web as it’s given us so much and was designed specifically to solve the problems described above. Let’s hope native mobile apps gradually turn out to be alright really. Fighting the lore of wikipedia is an increasingly futile battle but there are people who resist using and improving the online encyclopedia. The remarkable thing is that some of this resistance comes from the scientific and academic communities, two groups of people who are supposedly concerned with the dissemination of knowledge. With around 300 million visitors each month, wikipedia is firmly in the top ten of most trafficked websites in the world. But you don’t get 300 million visits without attracting some critics, many of whom object to wikipedia’s inaccuracies and the anonymity of some its contributors. What many critics object to is that wikipedia is the lore. That is not the law, but the lore, as in folklore. Like folklore, wikipedian knowledge often comes handed down by word of mouth, copy-and-paste and other questionable practices. The trouble with lore is, it can sometimes be unreliable, based on hearsay, gossip and urban myths rather than hard facts and knowledge favoured by scientists and academics. To some people, wikipedia is a lore which should be fought in every way possible. Professor Neil Waters is one of many examples of an academic who has fought the lore of wikipedia. Water’s students were infamously told that they can’t cite wikipedia in their work . They are still free to use it, but are forbidden to cite it, because of the lack of academic rigour. Wikipedia, the argument goes, is a “tertiary source” rather than a primary one and therefore not suitable for serious research. But people like Patricia Dooley have pointed out that academics fighting the use of wikipedia is hypocritical. In a small study published , she found that some university faculty members (the “two-faced professoriate” ) depend on Wikipedia in their teaching and published research despite the fact that they often discourage their students from using it. Are critics of wikipedia in the academy hypocrites fighting a losing battle? Has the lore of wikipedia won? At the time of writing, 90% of the search terms above have a wikipedia page as their very first Google hit. So, when it comes to accessibility and visibility, the lore of wikipedia is winning. So if you’re a scientist or any other kind of academic, there is plenty of help and advice on hand  and many different wiki–projects to get involved in. Don’t fight the lore, edit it. 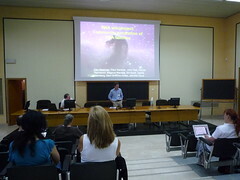 This is a brief report and some links from the second day of Network Applications and Tools in Biology (NETTAB 2009) in Catania, Sicily. There were two keynotes on the RNA WikiProject  by Alex Bateman and myExperiment  (by me) as as well as presentations by (I think but I wasn’t concentrating enough) Dietlind Gerloff, Guiliano Armano, Frédéric Cadier and Leandro Ciuffo. Alex Bateman (wikipedia user:Alexbateman) did an entertaining talk on the RNA wikiproject: Community annotation of RNA families where they have taken data from the Rfam database , and put it all into regular wikipedia. This project got quite a lot of media attention back in February. In this case, the primary advantages of “letting go of data” by giving it to wikipedia are that it is read by everyone who uses Google (where pages are frequently the top search result) and wikipedia gets lots more traffic than biological databases like rfam.sanger.ac.uk do. Thanks to wikirank which tells you what is popular on wikipedia, it is also possible to quickly compare the popularity of pages, see RNA vs. Ribosomal RNA vs Micro RNA vs SnoRNA for an example. The Rfam project have some interesting stats on who makes the most edits to the Rfam pages, it isn’t always the scientists who make important contributions, but anonymous users and machines (e.g. like Rfambot, Smackbot and Citation bot) who are often doing most of the hard work. There is a very long tail of contributors who make small contributions – which supports the 90% of users in on-line communities are lurkers who never contribute rule and is reminiscent of Citizen Science and Muggles. I wanted to put the slides from this talk on slideshare, but they contain some unpublished data. You can, however, subscribe to the feed of the Rfam and Pfam blog at xfam.wordpress.com, if you’d like to keep up to date on developments in this area. After the keynote there were presentations by Dietlind Gerloff on Open Knowledge (a new agent-based infrastructure for bioinformatics experimentation – nice pictorial intro using lego here) and Guiliano Armano? on ProDaMa-C – a collaborative web application to generate specialised protein structure datasets. The next keynote was on myexperiment.org, “Where Experimental Work Flows” – my slides on Who are you, Managing collaborative digital identities in bioinformatics with myexperiment are embedded below. I followed this presentation with a live 30 minute demonstration and discussion of myexperiment. The most interesting question people asked was Why use OpenID instead of full blown Public Key Infrastructure? (answer: OpenID is currently a lot easier and provides good-enough security). The rest of the day is a bit of a blur, I’m with Tim Bray in enjoying the monster adrenaline high of public speaking, but with all that ChEBI:28918 coursing through my veins it can be difficult to think straight (immediately before, during or after a talk)… so you’ll have to take a look at the proceedings for the full details of what happened in the afternoon – but they included Make Histri (great name! ), SBMM: Systems Biology Metabolic Modeling Assistant  by Ismael Navas-Delgado and Biomedical Applications of the EELA-2 project. By the evening time, there was some Opera dei Pupi (traditional sicilian puppet theatre), a trip to Acireale and a delicious italian feast in a ristorante (the name of which I can’t remember) to round off an enjoyable day. UK news-rag The Grauniad has a series of interviews with some of the people behind the next generation web, so-called Web 2.0. After reading these interviews, I can’t help wondering, who are the equivalent pioneers in bioinformatics? Q: What is your big idea? A: I don’t have big ideas. I sometimes have small ideas, which seem to work out. So who is currently pioneering the “Web of Science”, Bioinformatics 2.0 if you like? Ensemblian Ewan Birney? Ian Holmes at Berkeley? Or somebody else?